Being my home town, I know my way around here pretty well. There are plenty of good places to eat in Northampton. Just because I don't eat someplace doesn't mean there is anything wrong with it ... but this should serve as a good starting point if you are just getting into town for the first time, presented in no particular order. Also Scroll down for many off-topic "Quickies" and other links to get you familiar with this neck of the woods. For the time being, if a restaurant name is in red, it is one of my favorites. I break format on this page a bit. I put together a list of links that should save you many hours of Googling if you want to learn more about the area. - NORTHAMPTON IN SOME MORE DETAIL ... At one time I thought I'd do real estate, so I put together a page that gets deep into Northampton stuff. I didn't do the RE thing and the page exists ... I might as well share it with you: LINK. NEW TO ME: TULLY O'REILLY'S ... (The Old City Cafe) ... across from Sylvester's on Pleasant Street. Literally, a corner bar ... Keno, pleasant bartenders and food. Stick with basic bar grub ... a very good burger (I prefer mine with a regular bun, rather than the Texas Toast most sandwiches come on) ... BLT (again, regulat toast vs. the TT for me. The place is one step above a shot and beer joint ... they pour a superb Guinness, shots tend to be 'exact' ... (yesterday my friend got a shot in a 'neat' glass and the 'free pour' was embarrassingly sparse) ... overall, a worthwhile place. GRUB SANDWICHES ~ NEW TO WGEDC ~ ... Newly opened. An ambitious sandwich type menu … I was excited to have the Muffeletta … the roll was encouraging (it was round and the right color). It might have been an okay sandwich. But, (A) not for a moment did I think I was in New Orleans and (B) it wasn’t something I’d order again for $9+. I had their version of a "Juicy Lucy" with her horseradish sauce. It was very good. The burger and a yuppie bottle of tea came to about ten bucks. Worthwhile. On another occasion I had an omelet ... a flat-top omelet with superb roasted veggies and some meat. Overall a nice choice ... It would be a good alternative for a Sunday morning breakfast, but I think they're closed on Sunday ... Maybe you should call ahead, this ain't the "Washington Post" I'm a blogger not a journalist. ... (No Beer or wine.) 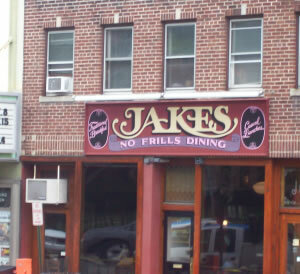 ... Gregg WILL be eating there. NEW TO ME: DELANEY HOUSE ... (Just down the road in Holyoke) I have started to hear very good reports again ... especially about the prime rib dinner night (which I enjoyed very much on my first visit). PAGE'S LOFT at THE CLARION HOTEL ... an exception to the "don't eat at the hotel rule. This is a reincarnation of a place that had operated in the same spot over a decade ago. And, by reincarnation I mean it is being run by the same, well-respected operator as in the old days. Early reports are that the food is superb -- and reasonable. I eat at the bar and had their loaded dog (very good) while watching the guy down a few stools having a very enviable steak. (Full bar.) ... Gregg WILL be eating there. There are some major changes underfoot ... all bets are off. I've not heard as many good reports as before. I wish them the VERY best. SIPS ... Very new. A nice setting across from city hall. A friend ordered the green salad and was disappointed the word "chopped" didn't seem to carry the same meaning as in "chopped salad" like she expected. 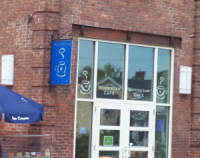 I think they are going to cater to people with the time and money to savor a well crafted coffee or tea. THE ROOST ... Brand, brand new at the end of town by the overpass. CIRCA ... Always one of the best alternatives. I'm surprised and saddened to hear Circa didn't survive what I understand is a recent change in management. UNION STATION/SPAGHETTI FREDDIE'S ... I'll miss the Deck, where many locals convened on nice summer nights. Apparently that business alone wasn't enough to keep the whole place, occupying the old train station alive year-round. The restaurant depended on a thriving economy, in that they they were trading in very large part on the atmosphere and setting. Update: The Deck remains open. Now without food, which is a good thing. Now you can bring food or have it delivered ... better food ... quicker service than the old days. KARMA ... was a kind of over the top raw tapas place downtown ... the sign on the door says they are moving to Hadley. The Hinge bar that they opened in the same spot is pretty popular ... same owners as Karma. THE BIG YELLOW COUCH ... it was probably a good coffee shop. 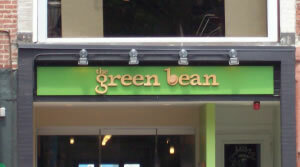 IS GREEN STREET CAFE CLOSING ??? ... Sadly, yes. LINK (Daily Hampshire Gazette, sometimes, annoyingly, you have to pay to read their content). GOOD BRUNCH IN NORTHAMPTON ... The Hotel Northampton brags about their brunch ... you won't find many locals there. BEST HAPPY HOUR ... I am not a big fan of Mama Iguana's ... but, I've heard it has a good HH ... they used to feature cheap food at HH, but you'd go broke on drinks. I like the camaraderie at the bar at Spoleto ... not exactly a HH tough. QUIET LUNCH IN NORTHAMPTON ... Paul & Elizabeth's ... Sometimes the place gets pretty busy, but you'll get good food, not feel rushed. Go to Williamsburg for Chef Wayne's Big Mamu, for Cajun ... quiet in a not crowded sort of a way. The Tibetan Place across for Thorne's. Finally The Auto Garden, behind the very well respected Green Street Cafe ... You'll enjoy food cooked on the grill and it might be the best secret in town. Picnic table ambiance might not meet the needs of someone who made this specific query. WHERE TO EAT WITH KIDS ... I have no idea ... I have no kids ... email me and I'll post your thoughts. So ... I've been enlightened ... out in Florence, about 2 miles west on route 9, is The Cup and Top ... I've met people there, as grown-ups, and never really appreciated the play area out back or the other accommodations that make kids and their adults feel welcome. Breakfast and lunch. It is more than a coffee shop and their food service is responsible, local ingredients and worthwhile, but not 100% consistant. Okay. Presented in no order at all. This place is anything BUT fancy. 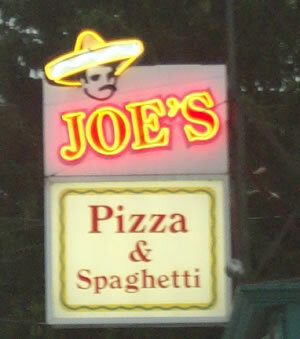 Joe's is known for a great thin crust pizza and other excellent Italian meals. Rustic food. No frills. Friendly bar. Gregg eats: Joe's House special (large, but Joe's large isn't all that large), macaroni soup, mussels. New owner as of summer 2011. I have seen changes ... too soon to say. They tried to "fancy up" a scallops dish and the grapefruit juice seemed less fresh squeezed and the prices seem to be edging up. I don't have a picture of their new location yet. Spoleto is has always been a loud, boisterous place with a line most weekend nights a very nice bar with friendly locals who are always out for some conversation to go with their Italian dishes. It always seemed to cost a bit more than to make everyday dinner eating practical. Calaudio has freshened up, maybe tightened up is a better way to say it and there are some very good, affordable dinner items. I order the bolognaise ... maybe with a VEP Green (which has gotten way too expensive). The bar is smaller, but I suspect they'll get the same very friendly sit-at-the-bar crowd ... I haven't seen the new menu, I suspect it has changed. Northampton's best bartender, Tara is back on duty many nights. 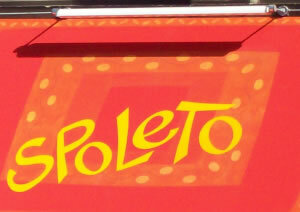 Also Spoleto Express on King Street for roughly same fare in a fast food setting for lunch and dinner. A really popular place just off Main Street. Successful, in large part, because of the coffee, baked goods and sandwiches. I get an "everything" bagel with cream cheese, lox, onion and tomato. I sometimes pick up a baguette to take home. Took over the space most recently occupied by the former KARMA. I've been here once. I'll be back. Matt the bartender, most recently of the Sierra Grill anchors the team behind the bar (a superb addition). A good selection of beers ($7 each range) ... my nitro-infused stout was pretty good (still a well-pored Guinness would have done the trick). I've never heard of any of them ... you'd expect them to have cask beers but they don't ... all beers are the same temperature. They innovative scheme seems to be that instead of handles on their beer taps they use door hinges. I had the Au Prouvere (sp) ... (essentially sautéed in pepper) burger ... with onion rings on the burger and fries on the side. The burger was just "PINK" enough ... fries were apparently plated waaay before the burger, I had to eat them first so they didn't wind up stone-cold. And now the big conundrum ... either the (excellent) bun was too big or the burger too small (apparently many people tolerate that, even at the renowned Local Burger up the block) ... but to me it feels like somebody is trying to fool me. I'm guessing the owners would say "customers tell us they like so much bread" ... ???? The lettuce was green and the tomatoes (well lets just say they might be able to source some that were, for lack of a better word, better). The place was packed ... the atmosphere was excellent, in my opinion, I'm now even less likely to go to The Dirty Truth across the street. Burger & Beer = $20 with tip. MassLive on Northampton Beer Scene ... presented without comment by me. 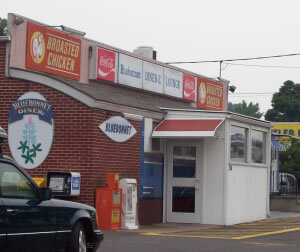 A really popular place just off Main Street on the side street by Local Burger. This was never on my list, but I hear the new owner is rocking the place. (4/24/2012) ... Ok, it was a Tuesday night (late afternoon actually) and I ventured in. I managed a seat at the bar. I was not the first, but I was clearly on the first shift. I had a drink and for the first time, I took a look at the Bar Menu ... so many superb choices at prices that make eating out do-able ... even the regular menu was reasonable. I had some kind of Cajun meatballs with mashed potatoes and gravy ... for $10 ... and it was, well, superb. I've been back a few times since. Hat's off to the owner, Deborah ... (or Deb) ... (never Debbie) ... for putting the finishing touches on a superb eatery. WEB MENU GLUTEN FREE ... I just spotted this. One of the best in town. Crap. I was so confident about this snapshot, I only took one ... and it turned out blurry. 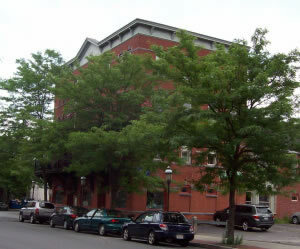 Here is a downtown Northampton space that, well lets just say it changes quite a bit. Although the next-to-last place that was here bought their own building and moved across town. THIS IS the most encouraging iteration for me anyhow. Having lived so long in Seattle where pho places are as omni-present as Dunkin Donuts are here, I've been long pining for pho ... good pho ... in Northampton. 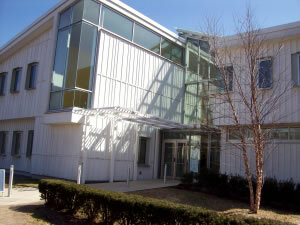 The dank (border-line dirty) lobby, weathered awning and scratched up glass belie the very pleasant space inside. (5/03/2012) My visit, to put things in perspective was on their second day open. I've always wondered how pho restaurants can have broth that is nuclear hot after dropping in the meats and noodles. This was not the problem here today. The soup was just one very small step below hot ... perhaps the meat was too cold when it was put in. It really wasn't a problem, except it took a little longer for the spouts to soften and the noodles were just a little toothsome at first. None of this was a problem. The broth was excellent ... the pinnacle of pho broth is Pho Bac in Seattle. The meat was tasty and just about ample. I like mine with chili paste and theirs was very good. I had the Pho Tai ... Regular size was $8.75 (I forget how much the large was) ... a tad expensive compared to Seattle, but I'm sure it is a bargain if you consider the rent they must be paying. I certainly will be back. I want this place to do great. Yelpers [too soon to say] the place. 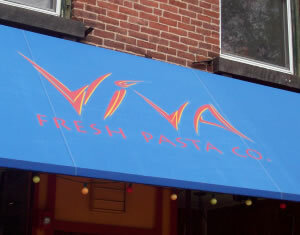 Ample, flavorful, authentic, easygoing atmosphere. They do have some eat-in selection. Mostly a "health food" grocery. Frozen shrimp. Conventional chicken. House-made Jerky. Nothing special. Yet that seems to be their hallmark. Enormous slices of decent pizza. A valid sauce gets them by. Custom take out 'za had undercooked crust and wasn't generous with toppings, but probably ok for a crowd. A slice or two after a long night out is a good investment towards feeling ok in the morning. Biggest, cheapest slice in town. Yet, more than viable. Stick with slices. We had a party sized pizza and it wasn't cooked all the way and the toppings were sparse. Just a sliver of a place. Eat. Run. If it is Friday night, see if they are having their AYCE Buffett. 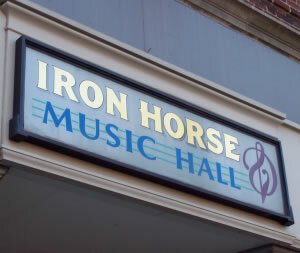 It is also Northampton's newest music venue. 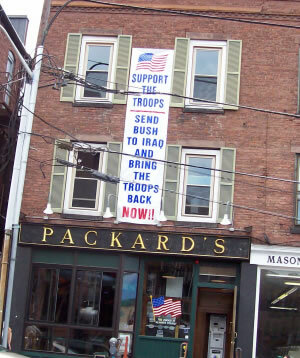 Packard's is open for a beer and burger lunch as well as dinner. If you get a friendly bartender, it might even be a pleasant experience. The problem is I've never had a bartender there who seemed anything but dismayed to have to bother with a customer ... If you are looking for a beer and some valid food while watching the bartender read the paper, this is your place. The food is slightly better than average pub grub. This is the first natural foods restaurant I'd ever heard of. They are located inside the Thorne's Marketplace of shops. 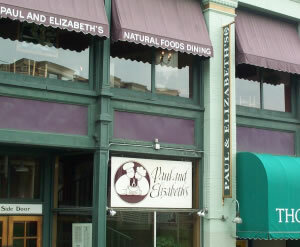 Paul & Elizabeth's serves up outstanding soups sandwiches and entrees. Not surprisingly, because they seem to use the best ingredients. 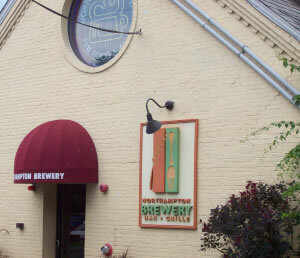 News is that the Opa Opa steakhouse, brewery chain has bought the building. The Sierra Grille is a tenant in the building. They are actually three places piled on top of each other in the old Bay State Hotel. So I lump them all together in this write up. The Sierra Grille is my favorite and is popular with almost everyone I talk to. Essentially the place is about excellent beer and wine and small plates to go along (kind of like tapas, but bigger). My experience, especially with their frites, which they are so proud of, is that things tend to be too salty. Bishop's Lounge ... Actually, I'm not even sure if they serve food. They are known for having good music weekends. It is a good place to enjoy a nice afternoon or evening and have a drink. At the old train station. Part of the Spaghetti Freddie and Union Station conglomeration, The Tunnel Bar seems to attract a nice clientele and they serve up very well-crafted drinks. The restaurants are now closed. Bars still open. Works for me! Below the old train station. Just a cafeteria really ... but you can get viable food at a good price. Nice salads and wraps. Total no frills dining right next to The Calvin and across from the hotel. 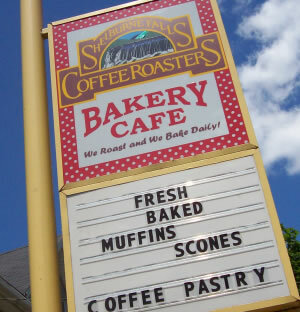 I used to go there for breakfast a lot more than I do now. Somewhere along the way, they made it so if you want home fries you have to order them separate ... so you get a big heap of potatoes, far more than you can eat, and it is a waste of food and makes the meal too expensive for what you get. New owners as of 2010. No field reports yet. I happened to have posted to Yelp before I did this. They used to have nice cold fresh milk in one of those gravity bag-of-milk thingys ... that was gone and replaced by milk from a cardboard carton that wasn't by its nature as fresh or cold. Breakfast potatoes were tasty ... (in the old place they'd gone down hill) ... but they were far from crisp ... (either a decision to do them that way, or they haven't mastered them, or maybe they are cooking for the masses ... do they hear occasional complaints from old ladies that "my home fries are too crisp" and are trying to please the masses? TODAY ... in this day and age, eating out isn't automatic ... a restaurant has to "nail it" and there is little room for error. Suggestion: take the old sign inside and put it outside and the new sign inside for a while to make a point. Steve Herrell innovated the smooch-in concept for ice cream years ago in boston. 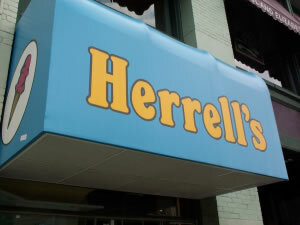 After getting the Steve's chain up and running he came here and opened Herrell's. Excellent ice cream, great smooch-ins in a fun spot downstairs at Thorne's Marketplace. Kind of a classic spaghetti and meatballs place. Better-than-decent Pizza in a decent family atmosphere. New owners spruced it up over the last couple of years. ... seems to get better and better all the time. A good selection of pizza by the slice. A good stop on your way home on a Friday or Saturday night when they close at something like 3 in the morning. If you are thinking whole pie, I'd go to Joe's. Very popular. Maybe for the music at night. I admit to having a preference for Pinocchio's up the street. 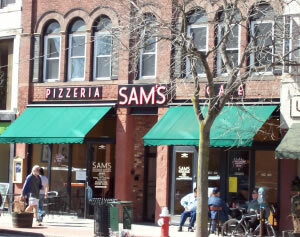 For a snack or a light lunch, Sam's fits the bill. Here's a health food place that has kind of morphed into a good, wholesome, breakfast place. But, a bit pricey in my book. I sometimes get the Itty Bitty, a fried egg with tomato and a touch of pesto and cheese on an English muffin. It winds up costing about five bucks to-go ... about the same as a hearty bagel with cream cheese and lox around the corner at Woodstar. Very good food from what I can tell. Best coffee in town. On King Street a few blocks further down than making a convenient walk from Main Street. SBCC roasts coffee in their own nearby plant and, here is the biggie for me, makes their own chai tea ... not too sweet like everyplace else. A world class small concert venue. Great acts, all the time. You gotta line up at 5:30 to get the best seats ... they kind of trick you in there for dinner. Overall, a bit better than pub grub. The veggie lasagna is good. But you are really just there for the music. Sometimes it is challenging to get parking nearby, so plan for that. Decent bar crowd on evenings and weekends -- especially in the good weather when it is hard to find a spot in the upstairs patio. Across from the park in downtown, I've only had to-go food here ... they have warmed up wraps that are very satisfying. Everything else looks good too. Fitwilly's was an innovator. Opened a very long time ago, it might have been one of the first, soon-to-be-clichéd "fern bars" ... since then ownerships has changed ... to this day the atmosphere at Fitzwilly's can't be beat. I recall for years they didn't even have a sign outside. It is always busy. Usually loud. Waits are not uncommon. The masses head to Fitzwilly's. In other towns the masses head to Fridays or Applebees and so on. I don't know why. The fact that Calvin Coolidge used to have an office here, doesn't have anything to do with the food. The BACK bar on a Friday or Saturday night is always a good place — for a drink. I just don't know any discerning locals who eat there unless they have to. Keep in mind, I never eat anyplace [only] because the atmosphere is nice. No matter what you are in the mood for, I'm sure you can find it someplace in Northampton. Now, next door, same owners, same kitchen (I'm told they have separate "lines") ... The Toasted Owl ... is okay. Not that I'd go there for dinner or anything ... but their appetizers are valid and the drinks are ok and the service is pleasant ... but it does have that sports bar vibe and it competes well in that category. And, as we venture away from Northampton ... This site seems to do a very superb job in researching the g-f world we live in: Gluten-Free in Western Massachusetts ... they have a newsletter I'll be signing up for too. Problem: at a very reasonable $6 a loaf for a good sized loaf of bread ... I can't eat enough at home before it goes stale. A great, downtown, corner market. An institution. Reliable vegetables. A very good deli and meat department ... they always have nice local alternatives in their selections. A very busy deli counter at lunch makes decent wraps and sandwiches, plus a selection of hot dishes too. The grocery aisles are always packed with excellent canned goods and other groceries. SERIO'S PHARMACY, next door, is a handy and affordable place to consider if you want to shop local. Another institution with a long history here. They have swayed from their fruit emphasis over time. The produce is ok, at best. Grocery selections are little downscale compared to Serio's. Excellent selection of beers and wine with a knowledgeable staff. But, if you are going for more than a bottle or two, you might want to head to the bigger places ... at State Street it can be as much as $4 a bottle more. Their deli is also reliable. You get decent servings. .... more below ... keep reading ... MS Front Page formatting headaches. A Great Bed & Breakfast ... from our friends at Pedal2Properties. 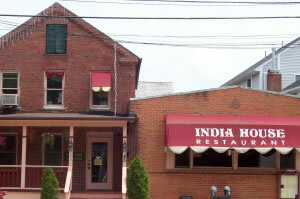 The Sugar Maple Trailside Inn is a recently restored 1865 Colonial home with Italianate characteristics that in 2003 was awarded the City of Northampton's Historic Preservation Award. The restoration and the interesting stories behind it were the subject of a segment on House & Garden Television’s (HGTV) acclaimed series, "RESTORE AMERICA" in November of 2003. Click HERE for a link to the video on YouTube. Hotel Northampton ... Right downtown, try for a room that faces the park or the street. Quality Inn ... A short walk to downtown. Standard issue exit ramp place. Autumn Inn ... Closer to Smith. A short walk downtown. Quiet. The Clarion ... A bit further than you'd walk. A little worn out, but passably clean and viable. The Hotel Northampton ... has a decent bar. No locals are eating there. ** Bistro Les Gras ... French-influenced bistro up on West Street by Green Street. I only went there once during restaurant week. Fare was good, I thought the wine flight they had to go with the meal was too sparse (nothing to go with dessert). So, I can't say with certainty how the place is overall and day-to-day. I would try it again and not hesitate to recommend it either. Caminito Steakhouse ... Argentinean. I've been meaning to try the place. I just haven't made it there yet. Great Wall ... for excellent (often-times) Chinese (use the gourmet menu) in a strip mall in Florence is a favorite of many locals. All the Sushi places in town are good ... I just don't eat at them enough to feel as if I should make a suggestion. Mama Iguana's ... I hear conflicting reports on their food. My last visit went nicely. NEW FOR ME: The Haymarket ... is a sliver of a place serving breakfast and lunch. Healthy-ish meal items, good portions ... at times, it seems to be too much of "the" hangout on Main Street for me to be comfortable breaking through the crowd of people (people, I'd probably not seek out for any reason) who are just lingering in front. BUT, someone pointed out that has gotten better lately ... I've been getting my morning coffee there lately and it has been quite good. Employees are always very pleasant. They now have table service ... downstairs ... at breakfast, and maybe lunch ... (I've only had coffee, upstairs) ... but, that might bode well. Their chai never seems to be heated to anything close to whatever "just right" is. A place that is this popular should be taken note of. Bela ... is a popular vegetarian place open for lunch and dinner ... I've never been there myself ... I just never seem to think of it. If you are so inclined, I'd try it if I were you. ** Buyeno y Sano and VeraCruzana ... are two perfectly viable places to get some Mexican-influenced food without losing a paycheck. Living nearby, I usually get two entrees to go and get three or four meals for my effort. The setting in each case is "upper lunch counter." ** Outlook Farm ... in Westhampton, specializes in farm raised pork. Although I never see any sign of actual pigs nearby. No ads here, just my opinions. There is a Trader Joe's and a Whole Foods about five miles out of town in Hadley ... try for an early to mid-morning excursion to avoid traffic headaches. GAZETTE RESTAURANT LIST ... includes some menus. NORTHAMPTON RESTAURANT WEEK ... in July and December. "THE VALLEY MENU" ... a comprehensive list with links to restaurant menus. PHANTOM GOURMET RESTAURANT DATABASE ... is from the somewhat commercialized Boston TV show of the same name. The compete with another show, THE TV DINER ... both are skewed towards boston, and I don't always agree with their findings (again I suspect they treat their sponsors extra special in the show). But, I post the links anyhow. 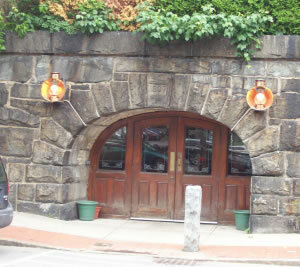 RUSSEL NOD ... A Pioneer Valley food blog. ARLO GUTHRIE CENTER "THE CHURCH"
SOUTH DEERFIELD: YANKEE CANDLE CO.